rec. Laukaa Church, Jyväskylä, Finland May 2008. DDD. Hands up who has heard of Friedrich Witt. Not many probably, for Witt seldom even makes it to the footnotes of musical history books. His main claim to fame is that his Symphony in C major - which is the first work on this recording - was once mistakenly attributed to Beethoven. In the early 1900s musical researchers uncovered the score and found the master’s name written next to two parts of the manuscript. Remembering that Beethoven himself had intimated that he had once attempted a symphony in C, the researchers put two and two together and got it wrong. It was left to H.C. Robbins Landon to prove that the work was really by Witt, a cellist and composer from Wallerstein. Nevertheless, the Naxos tradition of bringing the obscure to light has paid off in this recording. The three works presented give a fascinating insight into the kind of music that was being written in the tin-pot courts of Germany while the likes of Beethoven were developing revolutionary new means of expression in Vienna. This does not mean that the music is poor. Quite the opposite. It is bold and attractive stuff. 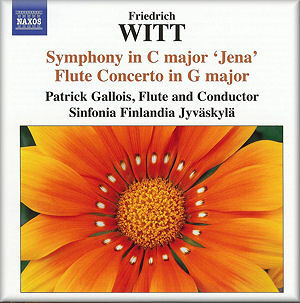 The C major symphony (nicknamed ‘Jena’ after the city’s university, where the manuscript was discovered in 1909) was composed in 1796 and is clearly influenced by Haydn. This is no coincidence. It is known that in 1792 or 1793 Haydn sent four of his London symphonies - Nos. 93, 96, 97 and 98 - to Wallerstein, where Witt must have seen them. The opening allegro is upbeat and playful, with a touch of Haydn wit. The ensuing ‘Adagio cantabile’ contains an attractive melody, while the finale is a fast-paced race to the finish that makes good use of the comparatively large orchestra at Witt’s disposal - including timpani and trumpets, as well as flute, oboes, bassoons, horns and strings. The Symphony in A major is less riveting. Written about six years earlier, it lacks Haydn’s positive influence and is hemmed in by simple and rather restrictive sonata-form structures. The Flute Concerto in G is much more satisfying. This work was published in 1806 and benefits from a fuller, heavier, orchestral sound. Nevertheless, it still inhabits the sound-world of Haydn and Mozart rather than ‘Eroica’ Beethoven. Patrick Gallois ably tackles the tricky flute solos while simultaneously conducting the Sinfonia Finlandia Jyväskylä. There is a quasi-Romantic opening to the second movement, followed by a fine flute melody which is developed and decorated. But the final Rondo brings us safely back to the late eighteenth century.